At the end of October 2016, Gartner Inc., the information technology research and advisory firm, published their annual Magic Quadrant report covering the changing Enterprise Content Management, or ECM, industry. The report serves as a touchstone for information technology leaders, providers, and analysts in how well leading technology providers are executing their stated vision and how they compare against their peers. The evaluation criteria and the scoring help decision-makers better understand what criteria to consider when evaluating a given technology as well as determining the strengths and weaknesses of each key player in the space. So, when the criteria for evaluating a technology changes from one year to the next, it’s important to take note to see what the changes were to the 2015 Magic Quadrant criteria, what’s changing in the ECM industry, and how it may impact your ECM strategy in 2017. This change reflects both how IT leaders are thinking about their solution architecture, the need for flexible, dynamic, and integrated systems, and the constant shift toward cloud. IT leaders and end-users are discovering that a monolithic, centralized, back-end system does not serve the needs of today’s distributed and diverse nature of business content. ECM vendors are realizing this also and are subsequently modifying and/or adding to their offerings in order to meet this demand. Revenue: They increased the revenue threshold derived from ECM software from $13 million in 2015 to $15 million in 2016 and added a requirement that at least 5% of that revenue come from cloud-based content management services. ECM Functionality: While the weighting of some of the core ECM components, such as “Document Management”, “Records Management”, and “Social Collaboration”, remain unchanged, several other factors were changed. They reduced the weight of “Image Processing” and “Content Workflow”, increased the weight of “Extended Services”, and added “Packaged Apps”, “Integration”, and “Analytics/BI”. Geography: Gartner now requires that at least 10% of the vendor’s overall ECM software must come from outside of its home market (i.e. North America vs. Europe). If vendor of technology that meets the criteria to be evaluated by Gartner, you want your technology to be in the “Leader” quadrant. The leaders demonstrate the most sound vision of their platforms and the ability to execute on that vision. In 2016, the number of leaders dropped from 7 vendors to 4. 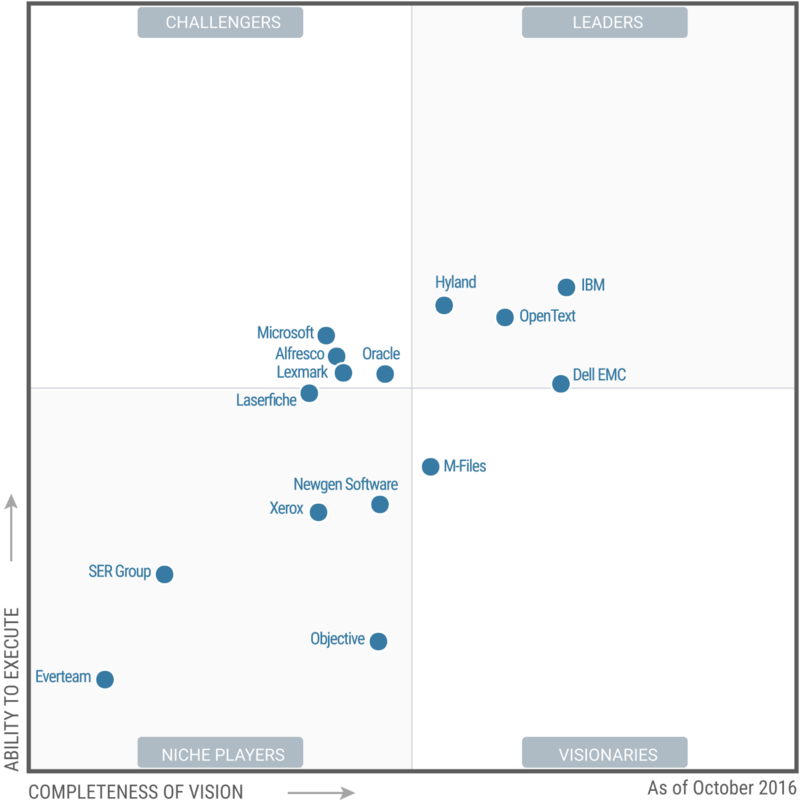 The four vendors that rank in the “Leader” quadrant are: IBM, Hyland, OpenText, and Dell EMC (soon to be part of OpenText.) Lexmark, Microsoft, and Oracle all fell from the “Leader” quadrant into the “Challenger” quadrant. As OnBase Authorized Solutions Providers, we’re pleased to see that Hyland remains in the “Leader” quadrant. We can validate that Hyland’s OnBase platform is well prepared for the changes taking place in the industry and poised to remain a leader. Further, with our technical expertise and web-based, service-oriented platform that can integrate and extend the OnBase platform, MTS Software Solutions is well suited to meet the changing demands of CIOs that are focused on building enterprise application architectures that are scalable, extensible, and cloud-ready. 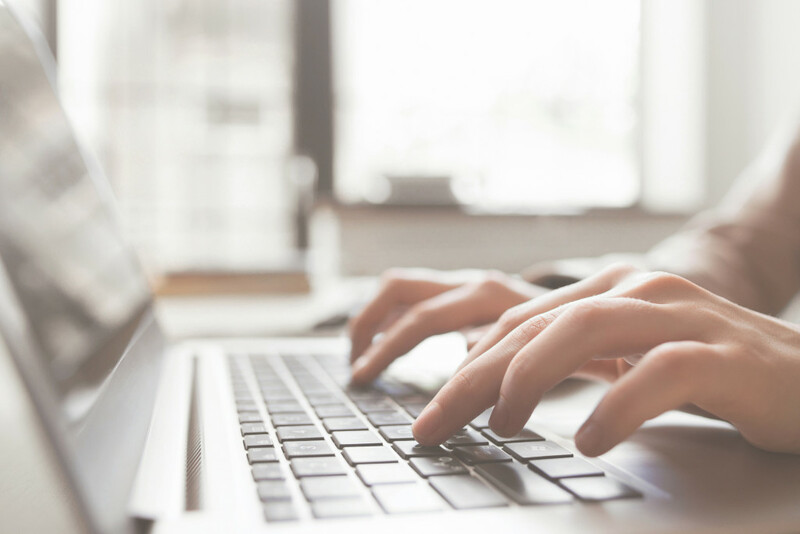 Leveraging the OnBase Unity API, we’ve built an integration gateway to integrate OnBase using RESTful API to other on-premises or cloud-hosted applications, such as Salesforce.com, Great Plains, or Oracle E-Business Suite. 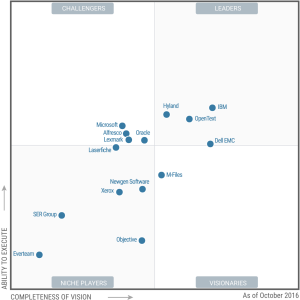 Interested in your own copy of the 2016 Gartner Magic Quadrant? Let us know.